Select "Create Class", then give it a name and a section, and click "Create"
The "Section" field is a secondary descriptor for your class, so here you may want to add something like 1st period, a grade level, or some other short description. Make a note of the class code and distribute this to students. Adding students manually Click on the class that you want to add students toThen click the "People" tab at the top of the pageClick the Invite Students icon (a plus sign next to a person)A search box will appear allowing you to search for the email addresses of individual students, contact groups or Google Groups. 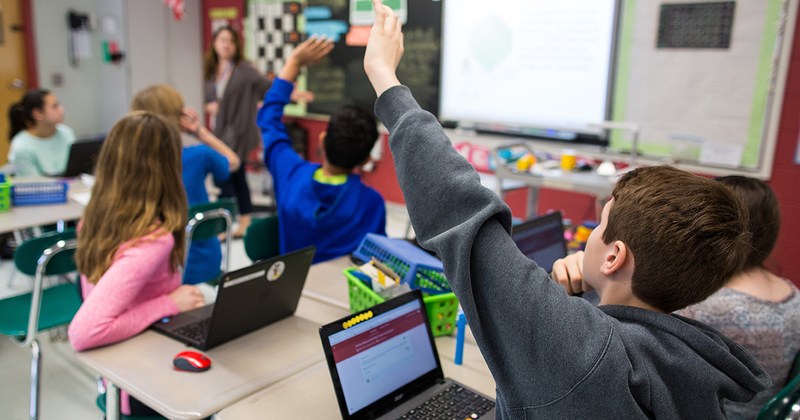 There are two ways to encourage dialogue between students and the teachers in Google Classroom. The first is the Stream - a Facebook-like wall of messages that can be viewed by all members of the class. This feature is available to both students and teachers. The second way to communicate is by using email. Students can click the three dots next to their teacher's name on the class homepage to open a Gmail message that is autofilled with their instructor's email address. Students can also email each other by clicking the Students tab, and clicking on the three dots to the right of the student's name and selecting Email Student. Teachers can do the same when they click on the "People" tab, however, they have the additional option of selecting multiple students and then clicking Actions > Email to send a message to a group of students. Choose the type of assignment you wish to create by clicking on one of the icons next to the word Assign. Your choices are to upload a file from your computer, attach a file from Google Drive, add a YouTube video, or add a link to a website. Click Assign to give this assignment to your students. Locked mode in Quizzes in Google Forms is a new way to keep students focused and distraction-free during tests and quizzes. Available only on managed Chromebooks, locked mode prevents students from navigating away from the Quiz in their Chrome browser until they submit their answers. Sign up for the beta today. We just launched a beta for Gradebook in Google Classroom, which provides instructors the ability to easily view and input grades across classwork and students. Instructors are able to view and customize average grades, set up weighted grade categories, and share overall performance with students. Sign up for the beta today. We believe in building tools that aim to reach all learners. Ready to learn about the accessibility features built into all of our products? From visual aids to voice typing and from closed captions to screen readers, learn how to customize these settings today. Have you ever found that perfect link to get students started at the beginning of class, or maybe a great link to use as a discussion prompt, well now you can easily use the Share to Classroom extension to assign it to students in your Google Classroom as a Bell Ringer Activity. EducationFind out about Google's commitment to education through our products and initiatives. Google ClassroomIdeas, tutorials and resources for using Google Classroom. Google Classroom Q&AWhat questions do you have about Google Classroom? This can be anything you want to know how to do! If I don't know the answer, I will find it for you. I will answer relevant questions on ShakeUpLearning.com. (Include your Name and Twitter handle to be notified and given credit!) Please refrain from using this to submit glitches or feature requests. Use the ? in the bottom left of GC to submit those. Share Your LiveBinder to Google ClassroomWe just added Google Classroom to our LiveBinders share options. Just click on the share menu from the player, editor, or shelf and you can quickly post your binder to Google Classroom. Apps That Work With Classroom | Google for EducationHundreds of apps integrate with Google Classroom. These apps can help support the classroom in many ways, from helping students learn to code to streamlining a teacher's gradebook.